In Wireless communications, Point-to-Multipoint communication (P2MP, PTMP or PMP) is communication which is accomplished via a distinct type of one-to-many connection, providing multiple paths from a single location to multiple locations. For P2MP, a central antenna or antenna array broadcasts to several receiving antennas and the system uses either Frequency Division Multiplexing or time-division multiplexing to allow for bidirectional traffic flow. A Point-to-Point connection (P2P) refers to a communications connection between two nodes or endpoints. The two units communicate using either Frequency Division Multiplexing or time-division multiplexing to allow for bidirectional traffic flow. For fixed links, this can involve use of high gain directional antennas which enables long distance and high capacity links. A CableFree Point to Multipoint Base Station, with a Quad-Radio CableFree Radio Base station and Four Sector Antennas. Also shown on this site is another Quad-Radio CableFree Radio feeding four separate Point to Point links (here shown as grid parabolic antennas). Commercial products available from 450MHz to 6GHz in both P2MP and P2P from many vendors. Some have integrated or external antennas. A CableFree Point to Multipoint Radio with Four Radio interfaces and Omnidirectional antennas for short range coverage. Other versions have directional integrated antennas. Commercial products From 4 to 42GHz. Note that only a few vendors offer microwave in Point to Multipoint configuration. 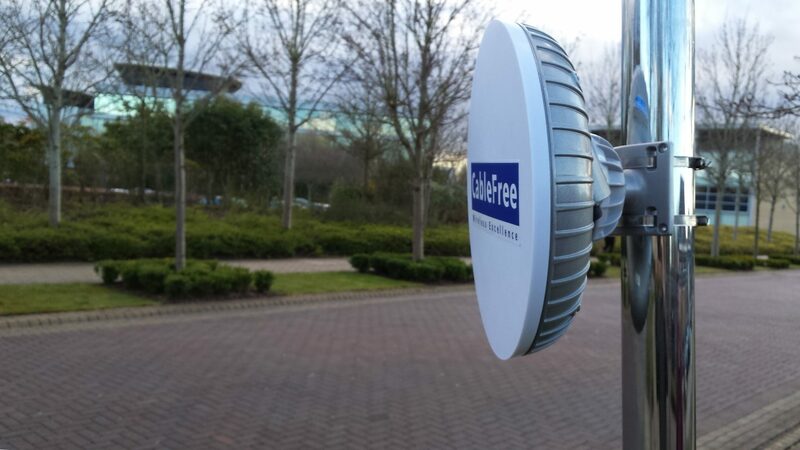 A CableFree Full Outdoor Microwave Radio for Point to Point communication. High gain parabolic antenna connected directly to the radio. Up to 880Mbps capacity or more. Commercial products available from 58 to 90GHz. Some P2MP products at 60GHz are available. A CableFree Millimeter Wave Radio for Point to Point communication. High gain parabolic antenna connected directly to the radio. Up to 10Gbps capacity or more. Due to narrow beamwidths and limited link margins, FSO is generally only used for P2P links. Please see our website CableFree which shows all products and useful technology FAQ pages.